The data is in and things just got hairy. A study of men and their grooming habits commissioned by grooming brand Braun some STRIKING figures about global men’s grooming trends. In New York specifically, the Braun study of over 1,000 New Yorkers, revealed those with facial hair now outnumber their clean-shaven counterparts, with 67 per cent of men now boasting some sort of hair on their face. “The Full Beard” is by far and away the style of the moment, with almost 1 in 3 bearded New Yorkers favoring the “fuller” style. The ‘Goatee & Moustache’ and the ‘Balbo’ were noted as the second and third most popular facial hair styles in New York, respectively. We know you love your beard, because we do too. But sometimes, you need to trim that sucker. And that’s where Braun wants to be part of your life. We have reviewed several Braun products, like the Series 5, the CoolTec Dry Shaver and the cruZer6 series and always came away impressed. The cruZer6 face is a piece of machinery we still use everyday, a steal at $80.00. 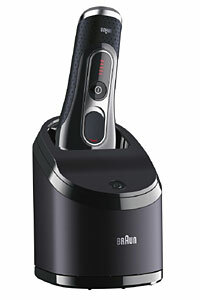 The Braun cruZer6 beard & head for $60.00 will help keep your beard, and life, in order. If you grew up in the 1950s when the electric shaver was a relatively new technology, a fringe lifestyle choice, how would you feel about how electrics have evolved? 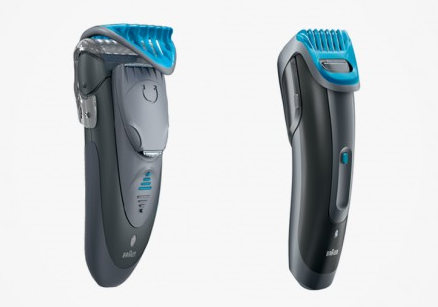 Because to me, the new Braun Series 5 Electric Shaver had everything I look for; it is the net result of 60-plus years of electric shaving “growth” and adaptation. To find out, I sat down with a 62-year-old man and we went at each other, point/counterpoint style. I tried a standard head-on razor early in my shaving career. My beard is thin (I’ll never be confused with my ape-like college roommate affectionately known as “Brillo-Man”) and my skin, baby soft – in a word, sensitive. My dad had a razor like that, and who doesn’t want to imitate his dad? I found his type of shaving experience painful at best. Put simply, I was scared thanks to a painful experience years ago. The new Braun Series 5 Hi Tech 5090cc men’s shaver with “Intelligent Clean and Charge Station” is a far cry from the brutish “Dark Ages” era of shaving in the ’50s. I opened the packaging and found a sleek head-on razor. I fired it up immediately and it sounded sophisticated – like the hum of a BMW. When I brought it to the underside of my chin, it was outstanding. The head can be moved 10 degrees in either direction for ease of reaching those hard spots. It was effective and not difficult to manipulate. Nothing to be afraid of, sir. I liked how easy it was to disassemble the Braun to clean. Popping the head off for cleaning was simple and it all snapped right back into place after. I was impressed because, back in my prime, you couldn’t take an electric apart to clean it. I told you you’d like it, you baby gorilla! Today, Braun unveiled its new branding campaign with the NFL and Seattle Seahawks Super Bowl champion quarterback, Russell Wilson. The campaign, titled #FaceGreatness with Braun Confidence, was developed to encourage men to be confident, to chase their dreams, and to never give up on their quest to achieve greatness. After leading the Seattle Seahawks to an impressive win in Super Bowl XLVIII, Russell Wilson is ready for another NFL season and wants men to know that achieving life-long dreams requires preparation and confidence. Visit the Braun website for more details by clicking here. Electric razors always bring to mind the image of a man in a cheap suit with a poorly tied, generic red necktie shaving in the front seat of his tiny import as he hurriedly makes his way to his job at Megatron Widget, Inc.
It’s sweaty, tight, confined and irritated, and there is nothing he can do about it. The pit stains on his off-white polyester dress shirt prove that to resist is useless. 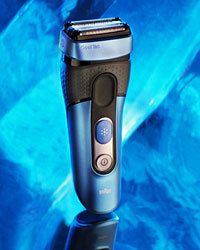 But this isn’t an electric razor — this is the CoolTec dry shaver from Braun.